Teaming up to scour the backyard for insects - Kylie, Heather and Ann Shirley. I often write about the natural world that lays waiting for me outside our back door. However, the part I focus on most often is that most unnatural part of our backyard - the vegetable garden. That, my friend, even with the natural bounty it delivers to us, even though it's organic and healthy and a green oasis for birds and reptiles, it's a fake rearrangement of natural elements. Those vegie out there would never grow in this area of their own accord; they are only there because they've been planted. Another instance of humans fashioning nature to suit ourselves. The potatoes planted on January 18 have sprouted and poked their heads up through the mulch. And I make no apologies for that, I am happy to have a productive garden. The trick in making the natural environment work to suit us is to make sure we do no harm doing it. We don't use artificial fertilisers on our garden, we don't spray insecticides around, we don't kill snakes or lizards; we manipulate our environment knowing that we must be careful doing it. One of those gentle manipulations is this water collection system Hanno rigged up. 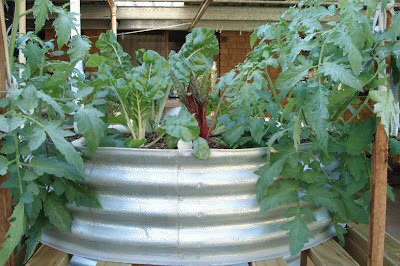 It's simply a 200 litre open trough that collects rain water from a down pipe attached to the roof of the chook shed. Those 200 litres are used fairly quickly, always in the space of a week, before any mosquito larvae have a chance to hatch, but it's 200 litres less that we have to take from our water tanks. 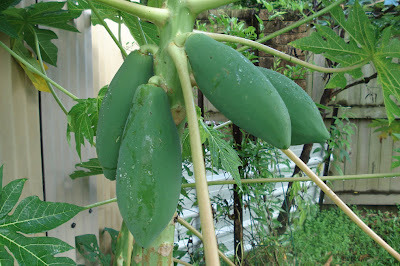 Red paw paw (papaya) growing next to the chook shed iron wall which radiates heat and helps the plant to grow. It's a similar thing on our roof. We have solar panels there which use the sun's rays to heat our water, and skylights which direct sunlight into our house to light two rooms inside without the use of electricity. I am hoping that we will buy more solar panels in the next year and not have to use any electricity from the grid, in fact, our solar generated electricity could very well go back into the grid. A very small collection point in that vast network. 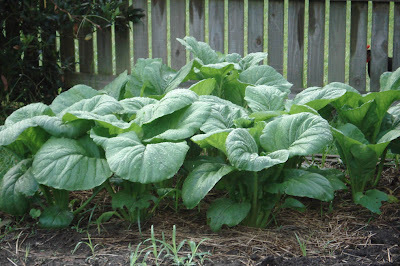 If you have a vegie patch, one of the things you could easily do to become part of the natural system is to grow comfrey and keep chooks. They will provide most of your fertilisers. Comfrey is richer in nitrogen than chook poo and is easily made into a nitrogen-rich tea, although, be warned, it stinks to high heaven. If you can't do that but still want to garden organically, buy fertilisers like blood and bone (bone meal) and seaweed concentrate. Seaweed is a wonderful boost for plants and provides them with the potassium required to flower well. More flowers, more fruit and vegetables. It's fallen over on its side because it's so heavy. It's time to pick. We're getting ready for our main planting which happens here in March. There are seeds growing in the green house and THE pineapple will soon be picked so Hanno can prepare that bed with chook poo, compost, worm castings and blood and bone. We do that every year, and in between each planting so we always have rich soil for our vegetables. I know many of our northern hemisphere friends will be planning their gardens now. Don't forget to treat the soil in your garden with respect, because unless it's healthy and teaming with microbes, your garden will be a disappointment to you. Gardening is a wonderful use of human energy. 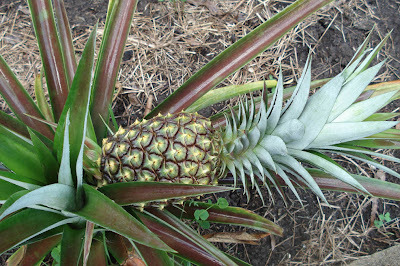 It will provide you with nutritious food that is much fresher than anything you can buy. It does cost money to set up a garden, but once that initial investment is made, and if you buy or barter for heirloom seeds, you will continue gardening for years without having a huge amount of expense. We have budgeted $30 a month for our garden (and many months don't use that much), and that allows us to buy straw mulch, the occasional bags of cow manure, fencing wire and the like. It's a wise investment. So who is planning a vegetable garden this year, and how many of you are first time gardeners? Things are grim down south. They're in the middle of a heatwave and the area right along the bottom of the Australia continent, that part closest to Antarctica, is sweltering in 45 C (113 F) heat. And it will continue for several days. Ugh. There are quite a few readers from southern Australia and I send my best wishes to all of you. I know how debilitating that kind of constant heat is. Have they closed the schools? I spent a pleasant day here yesterday and did everything I had planned for myself. We are having frequent showers of rain, so the tanks are all full, and the garden is looking as good as it gets during summer. One of the extra things I did yesterday was to start a sour dough sponge. I usually make bread with commercial yeast, and have often made the NY Times quick sour dough, but I want to get back to a traditional sour dough that will develop in flavour over the months, and hopefully years, that I keep it going. 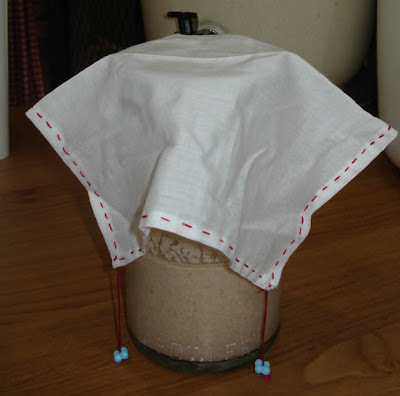 I'll write more about sour dough as the starter matures. All I did yesterday was to add one cup of wholemeal spelt flour to one cup of warm filtered water then mixed it together. It's now sitting in a wide mouthed glass jar on the kitchen bench. Overnight I covered it with a cotton cloth but I'll remove that soon so the wild yeasts in the air here will mix in the starter and help with the fermentation. One of today's tasks will be to make a jar or two of plum jam. 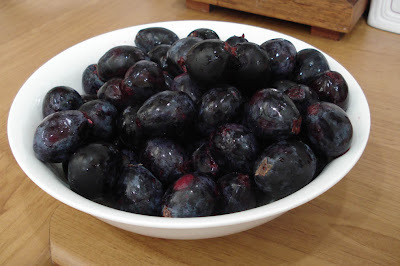 I bartered some eggs for a bowl full of Davidson's plums, they're a plum that is an Australian native rainforest plant. They're very sour when raw but make up into a nice jam that isn't too sweet. 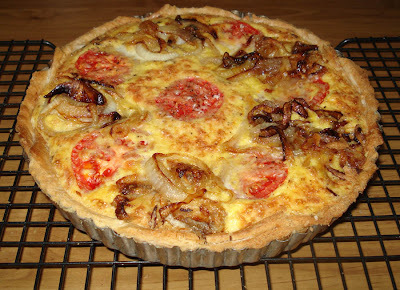 Still in the kitchen, here is last night's (and tonight's) dinner - a tomato and caramelised onion tart. Simply made with whatever pastry you care to make, or have on hand, I had two sheets of butter puff pastry in the freezer and used them. I blind baked the tart for about 15 minutes before adding the filling. To make the filling, peel and slice two onions and slowly fry them to caramelise. In a bowl mix together four eggs, about ½ cup of cream, one clove of garlic, about ¾ cup of finely shredded Parmesan cheese and salt and pepper to your taste. Pour that into the pastry shell, add some thick slices of ripe tomato and the caramelised onions into the mix, careful not to overflow it. Then just bake until it's golden brown on top - 20 - 25 minutes on 190 C (375F). I used a flan tin to bake my tart. It's delicious. I am always surprised by the generosity of some of the people who read here. 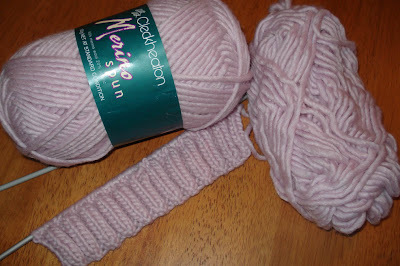 The lovely Rose told me she had send some cotton yarn and sure enough, it turned up yesterday. It's called Down to Earth! Thank you Rose. I appreciate your warm, kind heart. Hello to all the new readers who have come to read over the past couple of weeks. There has been a sharp increase in readership since Christmas so I hope you're all enjoying the posts and the archives. If you have the time, I'd love you to say hello. After a long time writing, editing and obsessing, I'll send in my book proposal at the end of this week. I'll continue to work on it until I send it to New York on Saturday, then I'll have a few days off, and start writing again; this time, the book itself. It's not the end of the proposal though. They will appraise it and make suggestions, I'll make my changes and it will go to be sold in mid-March. It's a long drawn out process but I have absolute faith in my agent and I'm grateful she's guiding me along this unknown path. 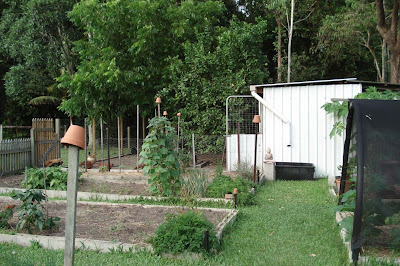 This, and the photo below, are photos of our little permaculture vegetable garden at work. 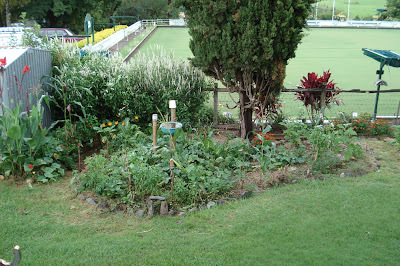 People who come in for food, are encouraged to pick fresh vegetables of their choice from these gardens. The book proposal has changed the way I go about my day-to-day activities because I fit my chores in around the writing. Of course, not everything gets done but we cope with that by either ignoring that I haven't ironed for weeks or we do patch up jobs to quickly take care of something that used to be part of a regular routine. We humans are incredibly adaptable and right here in my home, that propensity for adaptability has held me in good stead over the past few months. It's helped that Hanno is quite happy with however I choose to structure my days, and if the bathroom doesn't get cleaned for a week or two, he doesn't mind. Or at least he hasn't said he does. :- ) But this morning, that is the first thing on my agenda after I have breakfast. I will deep clean the bathroom. I will also make a loaf of soy and linseed bread, check on my seedlings, and the garden, because for the past two days (yes, also on Australia Day) I was at work. This first morning after those days at work is always the time that helps me readjust my thoughts and attitude from being out there - mixing with everyone else, talking, socialising, having lunch with lots of people around a kitchen table, laughing, counselling, organising, managing and leading, to being here, just the two of us, mostly silent as we go about our chores. It's a good balance for me, I have two days of absolute full on bedlam, especially when our Flexischool students are there (they returned from school holidays yesterday), to my five days of housekeeping, quiet writing and gentle home tasks. I get a lot of satisfaction from the work I do on those two days, it is the icing on my lifecake, but to return again to my home for five days here with Hanno is my real joy. I am indeed a fortunate woman to be able to live this way and to have the work that I do. 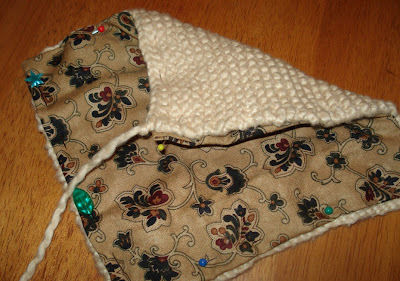 There has been no sewing done for a long time, although I've been toying with a pot holder. I knitted the back of it while watching the cricket a few weeks ago, and although I've cut out the front, I haven't yet sewn it on. I'm continuing with my knitting though and do some every day. It's like a meditation to me now and I feel a bit wonky if I miss a day. I'm currently working on matching fingerless gloves and scarf. It's a lilac/pink merino blend from my stash and it's knitting up quite well. This work I do makes me what I am; it defines my character. My voluntary work teaches me humility, and being in a position to help always encourages me to be a better person than I am. Housekeeping and gardening help keep the practical side of me focused and interested in my day-to-day life. Having something meaningful to do every day is a great gift and although there were days in my long distant past when I hated those days I had to stay home and clean up, now I see the true value of it. A reader asked recently if I'd write a post about what we eat during the week. I'm happy to do that but I think you'll see by our list that we're plain and simple people. I always cook from scratch and I tend to cook in a similar way to my mother and grandmother. We do have the occasional meal they wouldn't have known how to cook, but they're rare and I feel most comfortable with old-fashioned foods. If you're still learning to cook, I've written a post here about developing flavour in food without adding anything artificial. I believe it's best to understand how flavours work together and how food cooks than to follow a recipe to the letter. If you have that deeper understanding, you'll be able to expand beyond your recipes and create meals that suit your family and your budget while getting the best from the food. We usually have the same lunch - homemade bread sandwiches with salad, plus either cheese, tuna, salmon or boiled egg. Once a week we'll have scones instead of bread. We drink either tea or a cold cordial or water. I won't keep repeating that in the list below. 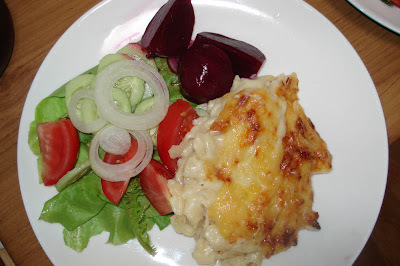 Macaroni and cheese with garden salad. Made enough for two nights. 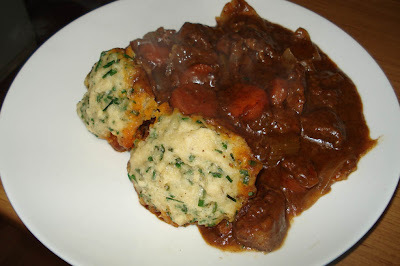 Beef stew with herb dumplings. The recipe for beef stew is in the developing flavours link above. As you can see our vegetables were mostly in the form of salads and potatoes. We don't have much growing at the moment but this will improve when we do our big March planting. We still have potatoes from the last harvest, golden nugget pumpkins, wax beans, bok choi, lettuce, cucumbers, capsicum (peppers) and herbs, so our meals are fashioned around what we have produced. 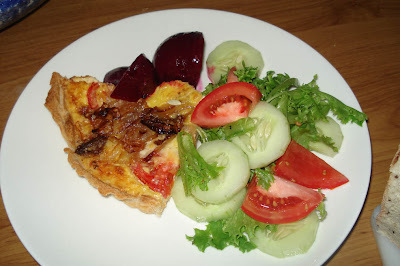 The salads are supplemented with home preserved beetroot and bread and butter cucumbers. I am buying tomatoes and onions at the moment. So, there you have it. It's not fancy but it's usually fresh and delicious and it keeps us going. We are both pretty healthy. Hanno takes medication for high blood pressure but I'm not on any medication. I hope you get some ideas for your own meals from this meagre sample. Cooking from scratch, especially if you have fresh produce, is a very healthy way to cook. ADDITION: Margaret has written a post about setting up a buddy system to help people learn how to carry out various household tasks, It's well worth a read. There is no doubt about it, things are grim. Jobs and homes are being lost, prices are rising and it looks like it won't improve for a long time yet. I know there are as many different financial situations out there as there are readers but one thing is common to us all, we need to save what we can. If you've never been in the position before of having to cut back and watch your money it's very confronting. But don't be anxious about it, this is just another skill you need to learn, and when you do, you'll get better at it. If you haven't yet worked out how much you earn and spend in a week or a month, now is the time to do that. You need to work out your current financial situation, start to track your money and then, with your partner, write out a budget that you both stick to. The most important thing to remember is that most of your savings will be small amounts. Don't worry that they are small, they all add up and will make a huge difference over the course of a month and a year. I promise you that when you get to the end of that first month, and when you look back on a full year of cuting back and saving, you'll be as proud as punch. And you should be, you will have made a big difference to your life. So what are all those small savings you need to teach yourself about? Start at the supermarket because that's where we spend money every week. If you have several supermarkets in your immediate area, go to each one and compare the regular shelf prices, not the specials When you're satisfied that you have the cheapest one that is where you should do your regular shopping each week. But then you should check out the specials and loss leaders of each store by looking at their advertising and flyers - a loss leader is the super special a store will advertise to get you into the store. If the loss leader is something you need, buy it, and leave. Remember, you'll be doing your shopping at the cheapest supermarket from now on. If you have enough money, buy extras of those things you use all the time when you see them on special and start a stockpile. cut down on the number of meat meals you serve during the week. buy generic or store brands - always check the country of origin before buying these and buy from your own country. check your local farmers market, if you have one, they often have the best and cheapest food. cook two or more meals at once to save the cost of energy, and your time. serve smaller portions if you think your portions are too big. instead of serving a large portion of meat to everyone, serve a small portion and add a dessert at the end of the meal. A nice rice pudding or fruit cobbler will fill them just as much as meat will. Don't buy too much. Make use of everything you buy and don't waste one thing. Make your own bread - it's healthier, cheaper and tastes better. Make your own cleaners - buy pure soap, washing soda, borax and bicarb at the store and make what you need at home. The recipes are here. Pack lunches for work and school. Other money saving strategies in the home include monitoring your electricity and water meters. Turn off the TV and lights when you leave the room and ask your family to do the same. Turn off the computer when it's not being used. Change your light globes to the energy saving ones. 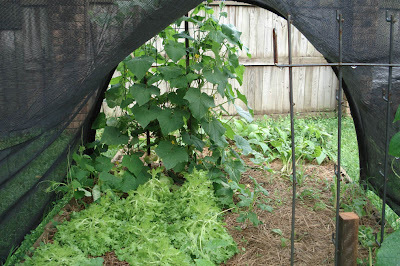 If you have space, plant a small vegetable garden. Grow what you eat but if you only have a small amount of time for gardening, grow those vegetables you eat that are expensive, like tomatoes. If you do grow tomatoes, barter some of them with a neighbour to get things like honey or eggs. It's not easy saving money but it's very rewarding. When you have a successful month you'll take pride in a job well done. And it will bring you closer to your goal of living simply - all the things I've written about here are the practical day-to-day tasks of a simple life. So don't be scared of doing this, don't think it's too hard or that you really want those new shoes. Now is the time for action and if you can do this, if you can cut back and teach yourself to save, you'll put yourself and your family in a much better situation if the economic situation gets worse. If you're doing something a bit unusual and it's helping you save, please tell us about it. There are many readers here who need help and a bit of encouragement, so if you can help with your suggestions, please do. We are all in this together. Here is some delightful Sunday reading for you. Ang lives off the grid in an old Amish farm with her husband and seven, soon to be eight, children. She writes here about cutting ice with her Amish neighbours and how she and her family had lunch in one of the Amish homes. The next post up, Ice Cutting Day two, tells of the following day when the Amish came to her home. They are wonderful posts, showing a peek at another way of life where sharing and helping are just the way things are. This is my recipe for scones. I have to warn you, I never measure anything so if these aren't quite to your liking, tweak the measurements a bit to get exactly what you like. I encourage you to do that with all your recipes. A recipe is a starting point, not an end point. 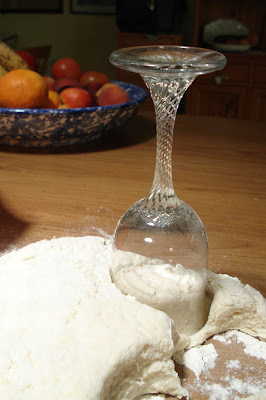 All flours are different and flour will take more liquid on a dry day than on a humid or rainy day, so add a cup of milk to start, then add it in small amounts until you have a dough you're happy with. Sift the flour (and baking powder if you're using it), salt and sugar into a bowl. Rub the butter into the flour with your fingertips until it's crumbly like breadcrumbs. Add the milk and mix. The one thing that will mean success or failure is the way you mix your scones. Over-mixing (and over-kneading) will kill them. You need what used to be called "a light hand" when making scones. That means that when you add the milk, you mix - I use a butter knife to mix - only until the flour and milk are just combined. Then stop. 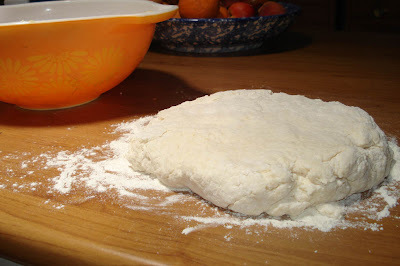 Take the mixed dough from the bowl and place it onto a clean floured bench. Knead the dough very gently, maybe only four or five times, until the dough is smooth. Over-kneading will ruin the scones. When the outside of the dough ball is floured and smooth, pat it down with you hand to about 4 or 5 cm ( 1½ - 2 inches) in height. Cut with a wine glass and place the scones , almost touching, on a baking sheet. Place in a pre-heated hot oven to cook until golden. Another factor that helps scones rise is oven temperature. Baked goods have two kinds of lift - the lift they get from the raising agent you use (baking powder, yeast, bicarb etc) and also "oven lift" which comes from the hot temperature when the dough first goes into the oven. What you are aiming for is a hot oven for the first five minutes, then turn it down. So, set your oven to it's highest - mine is 250C (480F) - while you're mixing your scones. Put the scones into the high heat oven for five minutes, then turn it down to about 200C (390F) and cook until the scones are golden on top - about 15 - 20 minutes. Just a note about the strawberry jam recipe. If you like a firm jam, add pectin to the recipe when you add the sugar. Also, in the US, make sure you use 100% pure cane sugar, not beet sugar in your jam. You need cane sugar to help jam set properly. Happy baking everyone! Let me know how you went with your scones if you bake some. Welcome to all the new readers who have joined us over the past week or two. I hope you enjoy reading here. Thanks to everyone who left comments, it's wonderful getting feedback, but more than that, I really love interacting with all of you and knowing that Hanno and I are not alone in our quest for a simple life. The jam jars have cooled, I checked that all the poptop lids popped down, one didn't, and now nine jars of jam are in the stockpile cupboard ready for eating or gift giving. That one jar that didn't seal properly is in the fridge and will be the first one Hanno and I eat. 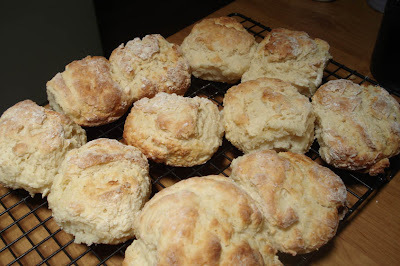 Yesterday I made buttermilk scones for lunch and had some jam on a warm scone. That, my friends, was delicious. By the way, what we call scones here and in the UK are called biscuits in the US. While I was eating that scone, I thought back to the many scones with homemade jam I've had over the years. My grandma was a frequent scone maker, so was my mother, but when I was about 10, she taught me to make scones, and from then on, always had a willing baker because she praised my scones as being the best she'd eaten. She knew that praising a child brought it's own rewards. I learnt that from her. In my family, scones were used as a kind of poor man's bread. If we didn't have bread from the bakery, we would make scones to eat for lunch. On those days we didn't have bread we would top our scones with a slice of tomato and cucumber, or cheese, or Vegemite or peanut butter. Some times we would add cheese or dates to the ingredients, for variety, when we made up our scones. No matter what we added though, they were always welcomed by all who joined the table and usually washed down with tea, for the adults, and either water or cordial for us kids. It's interesting for me now to work out why we thought of scones as a poor alternative to white sliced bread. I doubt it had much to do with price as my father was a baker and our bread didn't cost us anything. I am guessing that in those days, back in the 1950s, when things were starting to be packaged in plastic, having that 'new' bread in plastic was seen as modern and therefore more desirable, than the old tissue paper wrapped unsliced bread or, for that matter, hot homemade scones. Here is my quick calculation on the cost of making scones. This will make about 10. Milk - 15cents - 100 mls (3.5 oz) I usually use buttermilk in my scones but I can't find a price online for it and I can't remember how much it is. So all up that comes to $1.76, which is probably similar to the same amount of homemade bread. A loaf of Buttercup Country Split White Bread costs $3.60, half a loaf would cost $1.80, I think 10 scones would be the equivalent of between ½ and ¾ of a loaf. So it may be slightly less in dollar value, but a lot better for you health-wise (no preservatives), and for taste. We're all counting our pennies. Some of us do it to pay off debt, some to live in a certain way, some because we have to. Doing these little calculations for those products we buy frequently is a very good way of managing your money. But when you do your calculations, also calculate in the health benefits too, and if something is the same in price, or almost the same, it's best to go for the healthier alternative. 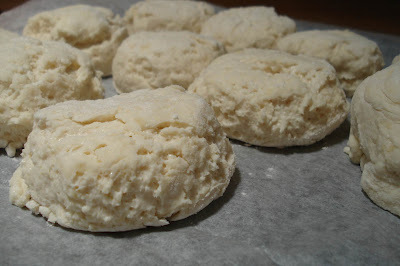 There are plenty of recipes for scones/biscuits online but I use self-raising flour, butter (never margarine), a pinch of salt, a tablespoon of sugar and enough buttermilk to make the dough. 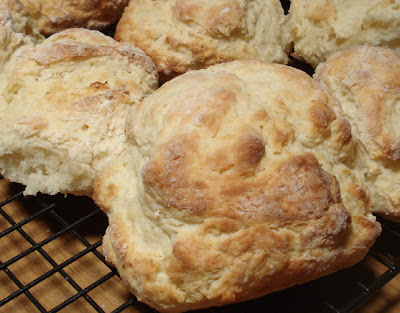 Buttermilk makes a very light scone and has fewer calories than ordinary milk. If you are making yoghurt, you could also use the whey from your yoghurt instead of the buttermilk. If you don't have enough whey, mix in a little milk to make it up. I never add eggs to my scones. I always cut my scones with a wine glass, my grandma did that and so did my mother. A wine glass is just the right size. When you make your scones, you want a cut edge, not a rolled or a hand formed edge. A cut edge will rise better every time. We eat scones for lunch about once a week; the other days I usually bake bread. Scones are much quicker than bread, they take less than five minutes to make and about 15 - 20 minutes to bake. 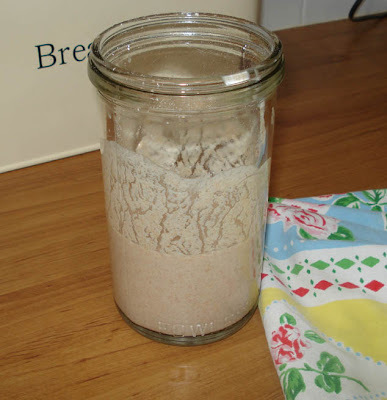 There is no waiting for the dough to rise, or mixing of yeast, so it's a quick alternative and certainly a recipe you should have in your armoury of common household recipes. By the time you've cleaned the kitchen and made your pot of tea, the scones will be ready. And if you have a little homemade jam to top your scone, you'll set a smile on your face that will be hard to move. I don't do nearly as much preserving (canning) as I used to. Since we made the decision to keep our garden going year round, there has been no need. Now I preserve only those foods I want to make into jams, relishes and cordials, and generally I freeze the juice for cordials when we have an excess. 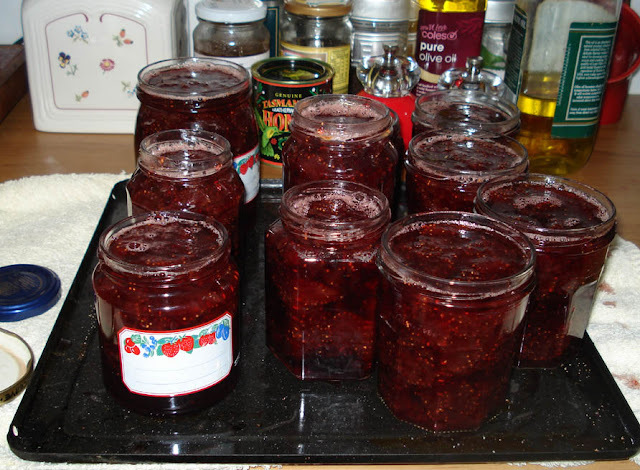 But we had a windfall of strawberries the other day so yesterday Hanno washed and cut the fruit for me and I cooked up a pot of strawberry jam. Cut up and ready for cooking we had 2.6kg (5.7 lb) of strawberries. When you're making strawberry jam it's good to have the mass of strawberries fully ripe, for a deep and full flavour, and a small number that aren't so ripe, because they contain more natural pectin to thicken the jam. I can't let today pass by without writing something about the wonderful inaugural poem and commenting on Dianne Feinstein. Before today, I had never laid eyes on Dianne Feinstein but each time she appeared on the inaugural podium to introduce this person and that, I was impressed by her outgoing personality and a little jealous that we in Australia have no comparable older women role models. I hope I am so together and in control when I'm 75. Others by "first do no harm", or "take no more than you need". On this day when 'anything can be made, any sentence begun,' I am pleased to remember this seemingly simple poem as one of its many highlights. I got up at 2am to watch the inauguration, and I am still now thinking of various parts of the ceremony and the words delivered. Hope is a great reward at the end of such a momentous day. Many of us are looking for ways to produce organic food in our homes. There was a time we had an aquaponics system in our backyard, and I thought it would be a good idea to talk about it again, despite the fact that our system failed and we sold it. 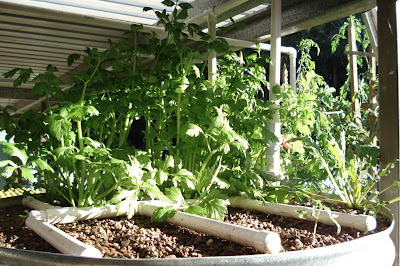 Aquaponics is a way of growing fish and organic vegetables in one system. The way we set ours up was with two grow beds on top of a 3000 litre (792 gallons) fish tank. 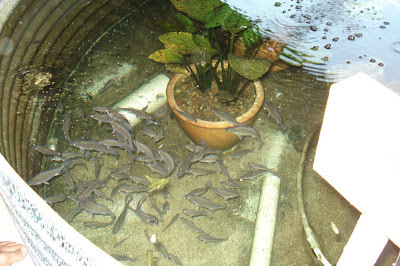 We kept silver perch in our pond, they're an Australian native freshwater fish. We had our system from March 2007 until the end of February 2008. We had our tanks custom made by a local tank maker but they are equally effective using recycled materials of sufficient size. Hanno rigged up all the plumbing and attached the bubblers and underwater pump. Our electricity bill barely registered the pump usage, I think over the course of a year it cost us about $80 to run it. 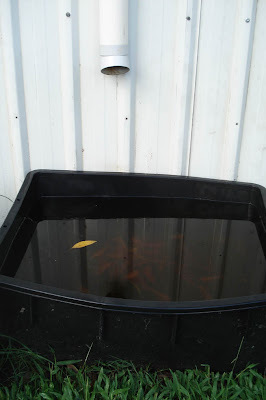 We used rainwater that we had stored in our backyard tank to fill the fish tank. We grew a variety of vegetables, including some decent pink brandywine tomatoes, chard, celery, parsley, beans, watercress, capsicums (peppers) and chilli. The taste was good and we couldn't tell the aquaponics produce from that in the garden. Of course we still kept our soil vegetable garden but having the fish and vegetable combo was a great project for us and it was very interesting to see what we could grow. I won't go into aquaponics in depth, please look at my aquaponics posts to see what we did, or go to Backyard Aquaponics. There are a few good photos there of Joel's system and a very good forum where you can ask questions and see what people are doing all round the world. The site is an Australian one but they have a lot of members in the northern hemisphere, including some members with hothouse aquaponics in snowbound America. Basically, aquaponics is a system that pumps the water the fish have been swimming in up to the vegetables growing in tanks above. 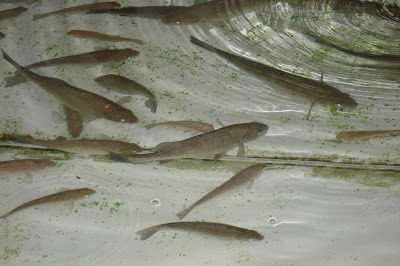 The fish waste in the water fertilises the vegetables, the gravel and microbes in the grow beds help purify the water and then it falls back into the fish tank as clean water. Over time the system matures with natural elements helping the fish and vegetables grow and generally, it will take about 12 - 18 months from fingerling to plate sized fish. Our system failed because we didn't understand the effect sun has on water. It caused algae to grow, which consumed oxygen in the water and when the fish didn't have enough dissolved oxygen in the water, they died. It was heartbreaking to see it happen. We didn't know why it was happening and every effort we made to save the fish was in vain. That was the second time our fish died, the first time we didn't know why, we think it was some poison, maybe someone in the neighbourhood had sprayed. Nevertheless, the second time it happened, we decided it wasn't for us, Hanno had to do a lot of work whenever anything went wrong, so we sold our system. I have to say though, that if we didn't have a very productive soil garden, we would have persevered with aquaponics, and by now would have been happily eating the fish on a regular basis. 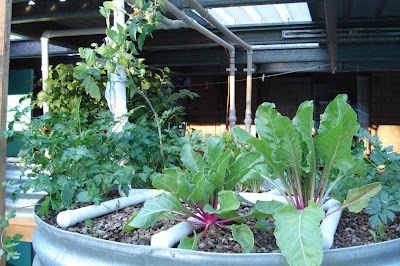 I think aquaponics is a good way of growing food if you have the time and strength to put into it. 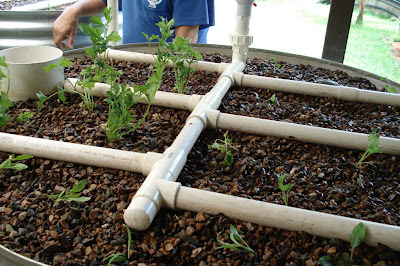 You need to learn a lot about how everything works together, and as it's a fairly new way of growing food, sometimes there are no answers, but it's an interesting hobby and if you get it right, a very good way to produce vegetables and fish in a small space. Unstuff writes about the failing economy and what she has discovered in the past year. It's worth a read. Hanno and I thank you all for the good wishes sent for Shane and Sarndra yesterday. It's a wonderful time for all of us and although I never thought I'd be like this, I kept thinking about it all day yesterday. Thank you for sharing our joy. 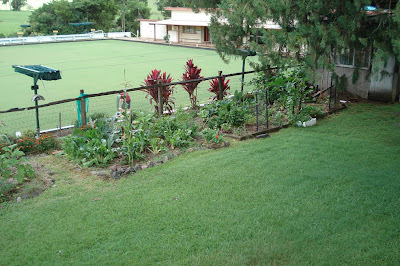 I mentioned yesterday that one of the things I had been doing on the weekend was a bit of garden maintenance. Maintaining our garden, tidying it up, removing dead and dying leaves and general, up-close checking of our plants helps us keep most thing growing as they should. 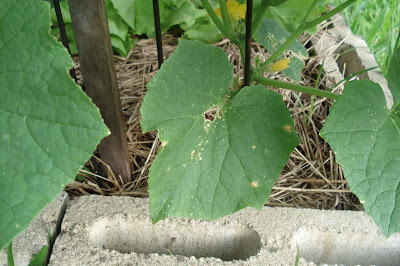 The main problem I came across in our garden was the cucumber vine had signs of disease and needed to lose a few leaves. I got my garden snips and started snipping the damaged and diseased leaves off, picked up parts of the fallen vine and reattached it to the trellis. These are two important elements of garden maintenance - clean up disease and damage, and make sure the plants are growing as intended. 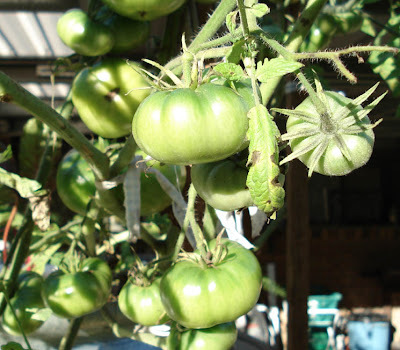 So if you see tomatoes that are falling over, tie then back to their stakes, and any vine that is touching the soil, needs to be pulled up and attached to the trellis again. Leaving damaged and diseased leaves on any plant will weaken it and make it more susceptible to attack by insects and other diseases. Clip off the leaves rather than pull them off because if you pull at the plant you may disturb the roots or strip off the plant tissue surrounding the leaf. While you're out there, give some time to making sure the mulch is not resting against plant stems - with the exception of tomatoes, they like it -pull the mulch back, or add more if it's needed. 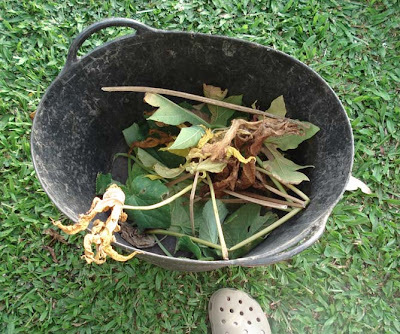 Make sure all the diseased plant parts go into the rubbish bin, not the compost. 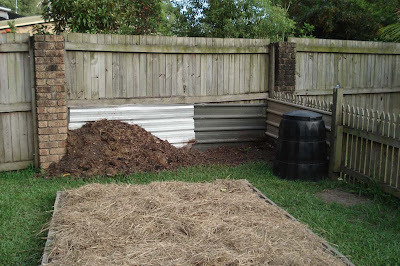 You run the risk of transferring the disease to your compost and it's best to get rid of the material altogether. If you're concerned about putting it in the rubbish bin to be taken to your local dump - and this applies to weeds, particularly invasive weeds, and diseased plants, place all the plant parts in an old plastic shopping bag and seal the top. Leave the bag in full sun for a week so that whatever is in the bag is dead before you transfer it to your rubbish bin. While you're in the garden, check on all your plants. 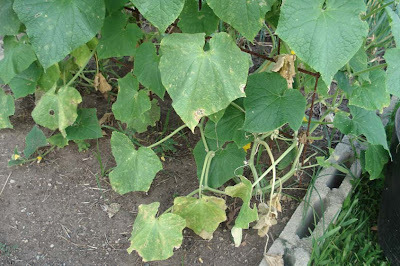 You may notice that some are beginning to flower, and if you're a seed saver, that will alert you that seeds are not far away and you need to watch that particular plant. 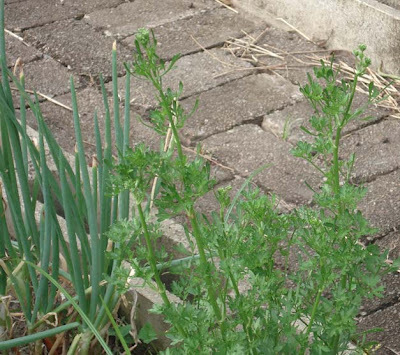 When I was in the garden on the weekend, I noticed our parsley plant is starting to flower. In a few weeks time, I'll harvest seeds from that plant from which I'll start more parsley. Mother Theresa said:"Be faithful in all small things because it is in them that your strength lies." I apply that wisdom to insects, as well as to other small things. Look for beneficial insects and wildlife while you're in the garden because they can help you combat insects that harm your plants. Some beneficial insects are bees, hoverflies, some small non-aggressive wasps, some spiders, praying mantis, lacewings and the common spotted ladybird but NOT the 28 spot ladybird. They will help you combat aphids, ants, scale and mealybugs. Frogs and lizards will also help you keep a lid on the larger insects like grasshoppers and caterpillars. To attract beneficial insects to your garden, you need to give them food and shelter in the form of a group of flowers they love. These include cosmos, marigolds, red clover, alyssum, dill, Queen Anne's Lace, buckwheat, lucerne and gypsophila. If you provide hollow logs and water, lizards and frogs might take up the invitation. You don't have to be fanatical about garden maintenance but it's a good idea to deal with problems as soon as you see them and to make a special effort every week or so to inspect the plants up close. If you can do that, you'll have a healthier garden and a more bountiful harvest. Yesterday started off just like any other day, I didn't know when I woke that it would become a day I'd remember all my life. I woke early, showered and wrote for an hour or two, then, when the sun was starting to come up, went outside, fed Alice, Hettie and the chooks and set about planting a few seeds. I like to get my outside jobs done before it gets hot. When Hanno woke, we had breakfast, and while munching on our toast, talked about what we'd plant in the garden this coming season and where to plant the newest passionfruit vine. Oh, the cricket was on too, we mentioned that and said we both should have our chores done so we could watch the cricket later; another normal day on the horizon. While I was outside, in that best of all lights before the sun came over the top of the house, I took these garden photos. It was coolish out there, I did some garden maintenance, and will write about that later in the week, talked to the girls who watched my every move, and thought about how today would be a good day because the cricket was on, I'd do some reading, knitting and odds and ends, and relax. Little did I know. I noticed Hanno turned the compost heap the day before. We have a cold compost at the moment, with not enough material to generate any heat, but with moisture and turning, to incorporate air, it breaks down nicely. You can see the heap, and our compost area, in the photo above. In the foreground is the potato patch that was planted last week. 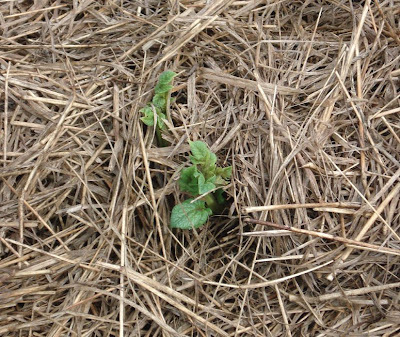 Now it's under a cover of thick straw and I just know that little potatoes are preparing to send their shoots skyward. It sounds like I had a very slow day, and although I did to a certain extent, I also did a lot of work while listening to the match. I baked bread for lunch, and an orange buttermilk slab cake, and minced up some of the grass fed beef we've been buying to make a meatloaf, which we had for dinner last night. It was the first meatloaf I've eaten in ten years, and was not very good. I'm not sure if I need to make adjustments to the recipe or if my tastes have changed too much to enjoy it. But during the afternoon, my step-son Jens came over to visit, I watched the cricket, did various chores in the house and generally enjoyed myself; we ended up winning by five runs. When the game was over, I prepared our meal - meatloaf, mashed potato and fresh coleslaw - and we were just finishing up, when Alice sprang to her feet and started barking. I looked out the front door and saw two people walking up the driveway - Shane and Sarndra had come to visit. Yipee! They had driven up to celebrate the birthday of one of their friends. They were meeting everyone at a restaurant down on the beach but just had to come in to tell us something. "We have some news..." they said. "We're getting married!" I jumped up and hugged them both, feeling more happiness, joy and excitement than I thought possible, then listened quietly while they told us their plans. Shyly, Sarndra showed us her engagement ring, which is beautiful. I could barely contain myself. I wanted to, quite literally, tell the world this wonderful news. I am so pleased that Shane has found the right girl for him, they're so well suited and obviously love each other very much. They both resigned from their jobs recently and have started making plans to go to New Zealand to live for a few months. A few weeks ago we agreed to take on their mother hen and chicks and Sarndra's cat, Princess, and we'll store all their possessions safely in one of our sheds. When they come home again, they probably marry then before travelling to Spain to live there for a while. Sarndra's father has a house in Spain and her grandma lives in New Zealand, so they'll have family in both countries. When they come back from Spain, they'll settle down and start a family. So as you can see, our very ordinary day turned into something to remember. We started making plans to meet Sarndra's family, her mother and sisters live in Brisbane, and for an engagement party. They said they want a small and frugal wedding, preferring to save the money for travel and their futures together. Oh course I loved that idea and I know that whatever type of wedding ceremony they decide on will be truly wonderful. There are good times ahead, and we'll be there to help them every step of the way. 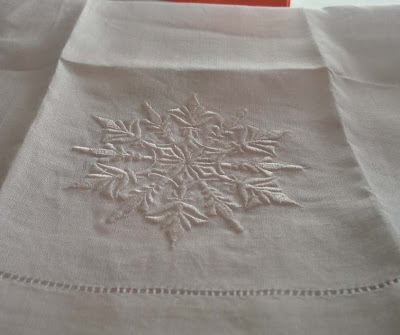 These beautiful linen towels arrived yesterday. They are white and stunning. I won them on the Long Thread's give away just before Christmas. Ellen is having another give away now of five yards of fabric. Enter before Saturday. Only a short post today because I've written about growing organic potatoes over at the Simple Green Frugal Co-op blog. You can read it by clicking here. I hope your week has been a good one and you're looking back on time well spent and progress along your path. Temptation is a terrible thing. The attraction of convenience is ever present, the habit of doing things the old way pulls us back and before we know it, we've stopped budgeting and shopping with our cotton bags, and we're back in the mall. Let's face it, living simply and pulling away from the mainstream can be difficult. We have to learn new skills, what we make usually takes more time than any store bought product, and there is more carrying, working, doing, mending, sweeping, cleaning, cooking, washing up and tending than ever before. Don't let anyone tell you it's easy. It gives you a better life, but it's more work. Some days it's just too much. So how do you stay motivated? The internet is the biggest library in the world. At any time of the day or night you can log on and find the ingredients for making anything - headcheese, government writing ink, or Mawmenee. You can find the instructions for making any obscure object you can think of, as well as all the necessary tasks you need to know to run a home efficiently. If I wanted to rig up a flying fox in the backyard or build a worm farm or darn a pair of socks or make bread or soap, I could Google the words, read the results of the search and by lunchtime I could be working hard on my project. But where does the motivation come from? When I started living simply, I removed myself from much of the temptation. I didn't go to the mall, I stopped watching advertising on TV, and buying magazines and newspapers. That helped a lot - I didn't know what was out there and I didn't miss what I didn't know. After a while, that kind of life became normal for me and now, several years down the track, I can go into a mall, buy the one item I went there for and walk away. I don't want anything and I don't want to look around at the new products. So where does the motivation come from? I have come to believe simple living is about 80% motivation, 10% skill and 10% opportunity. It certainly is that way for me. I have to work on the motivation less now than I did before, but it's still up there. The skill part of the equation is easily taken care of by googling or reading books to learn the new skills we need in this life, the opportunity usually has a lot to do with the stage of life you're at, but where does the motivation reside? Visiting blogs, reading books and thinking about my values keeps me motivated. The world of blogs is an amazing place that is only possible via the internet. Had you told me ten years ago that I could read about someone living happily in the wilds of John o' Groats or Kakadu or that I could write about my days and simply by pressing a button have people, world-wide, comment, well, I would have thought you were crazy. But that is the truth of it. I find that reading what other people do, who are striving to live as I do, with the ups and downs of it, with the successes and failures, that motivates me to do what I do every day. When I see it and do it every day, it becomes normal. It's like living in a small village that is different to the other villages. What we do here is normal, while being alien to those around us, but being involved in each others lives via our blogs, sharing what we do, learning from each other, that, my friends, provides the motivation to keep going. Seeing others do what we want to do, reading and seeing how others live their version of simplicity, urges us to do something similar. And motivation is the key to it all. You could have all the knowledge in the world but unless you are motivated to use it, to live the kind of life you aspire to, that knowledge is hollow and of little value. I am rarely motivated now by learning new skills, my motivation comes from seeing how those skills fit into lives - mine and others. Seeing how people use those skills to help them live. I believe we all have a responsibility to share what we know, to pass on knowledge, and encouragement, and to actively help others move towards a more sustainable life. It's a selfish act really. The more people living a greener life, the better off we'll all be, and, more importantly, the better the world will be when our grandchildren are our age. I hope my blog gives you the kind of information you need to skill yourself and make your home the place you need to live well. But more than that, I hope you find motivation here, I hope what I write makes you get up and move. There is a lot to be said for simple life and I hope you can fashion your life to live to your best potential. You will pick up the skills you need as you go, a little at a time, but you need to work on the motivation, because if that goes, you will just be left with a plan. I have to admit to being out of my routine with Christmas holidays and working on my book every day. I returned to work this week, and was happy to be back. I'm looking forward to a year full of work, both at home and at the Centre, that will enrich my spirit and lead me gently along this path I'm on. It will be a busy year, I know that already, but I'm up for it, and as my mother would say when she was very busy, "I least I know I'm alive." I haven't had a chance to take any photos lately, so I just looked back to see if there are any here that I haven't used yet. There are a lot that don't seem to go together, and maybe I'll just use them all together one day for a post about nothing - a Seinfeld post. However, there was one little beauty that shot out at me and suggested a post about leftovers and stretching food. A worthy subject for a blog such as this. We often eat according to what is growing in the garden at any particular time. Recently, we harvested about eight golden nugget pumpkins. Some were smaller that normal and some slightly larger. For those who are not familiar with this pumpkin, it is a small variety that's usually about the size of a small rockmelon (cantaloupe). They don't form a vine and instead grow to full maturity on a small bush. Whenever I have a nice pumpkin, I make pumpkin risotto. So we had our pumpkin risotto for an evening meal and had some leftover. 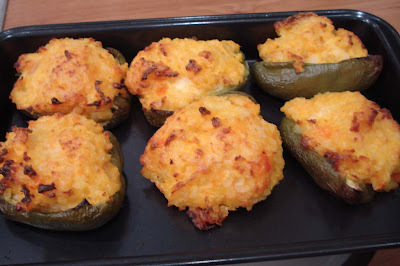 The next day we harvested six green capsicums (peppers) so I used the leftover risotto to make another delicious meal - stuffed capsicums. There are never real recipes for leftover meals, you use your imagination and combine flavours you know your family will like. Don't worry that you've never seen a meal like the one you're making before. That's the beauty of it, you make it up as you go, and as long as your family enjoys it and eats up every last crumb, it's a success. So, to make up my stuffed caps, I washed the capsicums, cut them into two equal halves, scooped out the seeds and membranes and filled the little cups with a large spoon full of pumpkin risotto. There was already Parmesan cheese in the rice so I didn't have to add anything else. I put it in the oven for 20 minutes and out it came, all golden and crispy on the top. Delicious, easy, fast and frugal. Stretching one meal into two is a great way to cut costs. Stretching food and eating leftovers was common back in our grandmothers' day and it can be used now by those people who are making the most of every dollar they have. I often cook knowing I will have enough for at least two meals for the two of us. Do you have a little bit of corned or roast beef left over? Cook some potatoes, fry a finely diced onion, mash the potatoes, add the onion, cut up the beef into little cubes and add it, add an egg and salt and pepper. Form it into flat fritters and fry in hot oil until golden. They would serve you quite nicely with a fresh garden salad, or on a piece of homemade bread with a slice of tomato and lettuce. What about that roast chicken you cooked yesterday. It's still got a little bit of meat on the bones, but not enough to serve four hungry people. No worries! Strip the meat from the bones and put it aside. Add the chicken bones to a pot of water, about 1.5 litres (quarts), add salt and pepper and whatever herbs you have, and a chopped onion. Bring to the boil and then turn down the heat and simmer for about 30 minutes. Look in the fridge and garden for some vegetables and chop up what you find - maybe a zucchini, celery, pumpkin or potato, green beans - whatever your family likes. Add these to the soup and cook for another 15 - 20 minutes. Five minutes before it's ready, add the chopped chicken meat. Test taste for seasoning. A nice addition to any soup is herb dumplings. You would add dumplings just after you add the vegetables and the soup has returned to the boil. Rub into the flour about two tablespoons of softish butter. Rub the butter in with your finger tips, just like you would when making scones (biscuits), until it resembles breadcrumbs. Forms small balls and drop them into the soup. The dumplings will cook on the top of the soup. They will take about 15 - 20 minutes to cook, so add then just after you add the vegies. And now I'm looking froward to reading about your favourite leftover meal. Here is Hanno with our boys, Kerry (left) and Shane. This was probably taken in 1983 or 1984. I smiled when I read Heather's indoor clothes drying post on the Simple Green Frugal Co-op the other day. She made me smile with this: "I asked my husband to build us something that could take the place of our portable wooden drying racks." Gee, I've used a similar sentence so often over the past 30 years. And still, I get what I ask for. Hanno and I fit together like a pair of gloves. We aren't alike, but we sort of mirror each other; what he can do, I can't, what I can do, he can't. He's in the background of my blog, you might see him in photos working away, but in reality he's very much at the forefront of our lives. I had to talk him into living this way, and he took some convincing, but once he took the plunge, he was in it with me 100% and every day he reaffirms his commitment to living simply, just as I do. I guess it's like that with a lot of wives here. They work on their blogs and while we see glimpses of the boys in the background, they're always there making drying racks, connecting water tanks, looking after the children, shifting snow, carrying heavy parcels, and being supportive in the quietest of ways. I know that Claude is there with Sharon, Big Papa is there for Jewels, Matt is supporting Melinda, we see little glimpses of Jerry with Suzan. And there are a hundred others I see when I visit the community of friends we have here. The husbands, partners, boyfriends are all there in the background of these blogs, building, carrying, guiding, talking, holding and providing. Happily, every so often, we see a husband venture forth with a post when a wife is otherwise busy, or ill, or having the newest baby. If you have ever doubted this husbandly devotion, read this from Soulepapa. 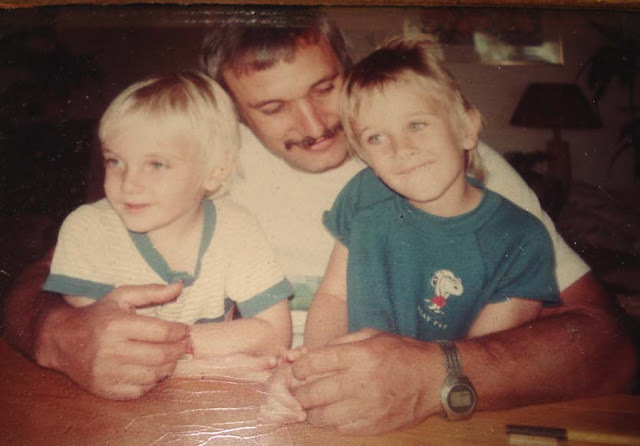 Those little Soules have a wonderful father there - a man who will teach his children that strength mixed with tenderness is the finest concoction. But what of the man who lurks in the background of this blog. Well, when I returned from work yesterday afternoon, he was in the backyard. 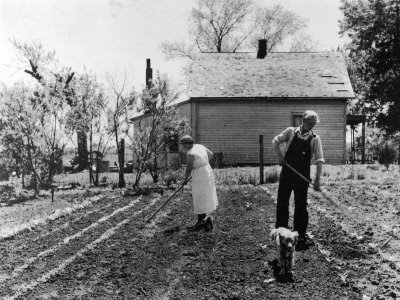 I'm not sure what he was doing, probably watering the vegetables, or collecting them. He came over to help me with what I had brought home - my basket, along with a big pile of tea towels, tablecloths, net food covers and cleaning cloths that had been folded up and left on the kitchen table at the Centre over Christmas. (Not good.) He asked me what the bundle was, took it from me and quickly sorted it all out, shaking each item, as he put it in our outdoor washing machine. (Later, after I went to bed, it was all hug out to dry.) We went inside with me telling him all the days big events, and while I sat at the kitchen table, he served up dinner and icy cold glasses of water. And ... he tidied up afterwards. Well, the first BIGGEST kitchen table worked well and is now finished. Thanks to everyone who took part on the first kitchen table talk on chickens. I've visited everyone who left a link and written down a couple of the recipes. It was a wonderful way to share what we know about chooks, looking at the photos showed me how different we all are. The kitchen table was a lot of work and it will be something I will do each month, not each week ,as some of you indicated on your blogs. But it is definitely something worth repeating as it allows us to share and build a community of friends. When you travel around the other blogs, and I encourage you to do so, please leave a comment, even if it's just to say hello. Posting takes time and it's very disheartening to write and add photos and then have no one acknowledge you. I am going back to work today. It will be a busy day because there are a lot of things to be put away after the Christmas breakfast, as well as a new tenant moving in, and all the normal visits and phone calls we have. I'm looking forward to going back, I've missed it. I hope you all have a wonderful week as we all look towards this new year. We'll start our kitchen table talks today with the topic, chickens in the backyard. I want to encourage you all to get involved in this, learn a useful skill, or contribute to the discussion, just like you would if we were all sitting around a kitchen table with our cups of tea and coffee. This talk is aimed at those folk who have never kept chickens before, want to, but haven't got much of a clue about their care and needs. I hope all of you who have experience with chickens join the table and help pass on the necessary information to the novices. Those of you with no chooks, please add your egg recipes. I'm still not entirely sure how these talks will go. For the time being, if you want to ask a question, simply write it in the comments and I'll answer what I can or pass it on to our other experienced chook people. 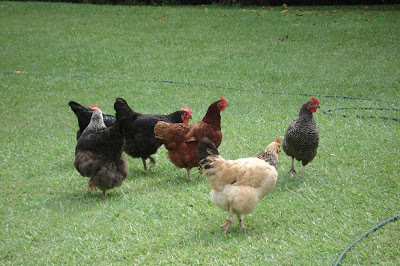 If you want to write your own post and show us your chickens, do that and give me the link to your post in my comments. You will have the weekend to add to this. I'll add all the links to my post soon after they turn up and we can all tour around reading what everyone has to say. On Monday morning, I'll do a followup. The vast majority of chickens are hatched in Spring and Summer. Day old chicks are often available for sale but when I'm getting new chooks, I usually go for point of lay pullets that are between 18 - 22 weeks old. They will start laying a couple of weeks after you buy them. When you buy point of lay pullets, they will have been sexed and you'll get only hens. When you buy day old chicks, they won't have been sexed and you'll get approximately 50/50 girls and boys. If you intend buying chickens, you need to have their housing ready before you bring them home. You MUST provide safe housing. There are a lot of predators around - dogs, foxes, feral cats and other wildlife that will wander in under the shadow of darkness. When you bring them home, lock the gate on their coop and leave them to settle in. Don't let them out to free range for at least a week - during that time they will learn that is their home. When chooks know their home, they usually come home to roost when the day light starts to fade and usually you don't have to go looking for them. This is Margaret Olley, my favourite chook. She's a buff (that's the colour) Sussex. Most local authorities will have a bylaw about the keeping of chickens. Where I live we can have up to 20 chooks and the chicken coop must not touch a neighbours fence. Please phone your local county, shire or council to ask about their regulations before you buy your chickens, or Google "chicken regulations ......." and add your town to the Google search, instead of the dots. Chickens need a place where they feel safe and can lay their eggs. One nest per five chooks. We have four nests here with 11 chickens but we usually have at least one chicken broody and taking up a nest all the time. 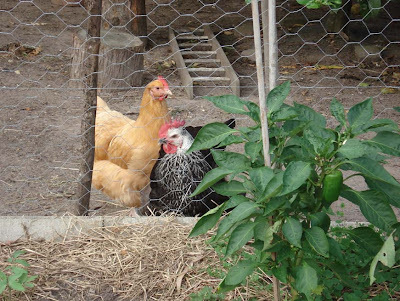 If the nests are high off the ground, you'll need to provide a little ladder or steps for the chooks to reach the nests. Click on the photo to enlarge it. This is our set up. We have a hen house with a lockable enclosure attached to it. That is all fenced. There will be times when you need to keep one chook apart from the rest. When that happens, we put them in the lockable area attached to hen house - that is directly behind the lemon tree. When that area is not being used, we make fast compost in there. I'll write about that again another day. You can see the gate to the hen house is open. We close that every night. Your ladies will sleep on a roost. That is a horizontal bar, like a small tree branch. The higher up the chickens is when they go to sleep, the higher up in the packing order they usually are. Generally your topchook will be up on the top roost at night. How to build a hen house. Some chooks are flighty, some are very placid, but overall, chooks don't cope with stressful situations very well. Here is a handy guide to chicken breeds - I hope you get pure breed chooks. This chart will also tell you whether the chickens are suited to hot or cold temperatures. We have a mix of Sussex - one buff, one silver, one salmon Faverolles, two Rhode Island Reds, one New Hampshire, two Australorps, one Australorp cross, one buff (the colour) Orpington, and one barred Plymouth Rock. If you live in a city, you may only be able to find crossbreed chooks like Isa browns. These are a hardy type of chook bred for the caged industry. They'll lay well, at the expense of going broody, which a lot of people like. They generally don't live as long as pure bred chooks. The smallest number should be two. Solo chickens are sad birds. However, there will be times when you have to isolate your chooks and keep them on their own, generally chickens prefer to be with other chickens. However, having written that, we used to have a chook called Jewels - a golden Hamburg, who hated being with the other chooks and always sat with the dogs. Your chooks will know the other chooks by sight and when you want to introduce new chooks, the older ones will give them a hard time. Get the number of chickens you have room for. We have 11 here and we get about 8 eggs a day. A little flock of three or five girls will give enough eggs for a family of four or six. When you bring new chooks home, and you already have chickens, isolate the new birds, but put them where they can see and be seen by the other chooks. Keep them isolated for a few days. This will help them assimilate and when you let them out together, there will be less pecking. Pecking each other to establish pecking order is natural behaviour for chickens. Don't intervene unless you can see an open wound or blood. Then you'll have to remove that chicken until she has healed. Chickens can be vicious if they see blood. From my experience, about ten years, give or take. Cross breed chooks, generally eight years. They will continue to lay eggs up until they die but when they're very old, you will only get about one egg per two months. We have found over the years, that if you get a flock of say eight or ten girls, in five years you'll have maybe six or seven. Chooks must have clean water ALL THE TIME. Get into the habit of giving them clean water every second day, or daily if they drink a lot. If you have bought day old chicks, they're need chicken starter crumbles, if you have point of lays they'll need laying pellets or laying mash (mash is a combination of grains). Or you can make your own mix. If you intend to supplement their diet with greens from the garden, or kitchen scraps, start this early as they get picky later and will stay with what they know. Chickens are omnivores, they eat meat, grains and vegetables. They love cheese, yoghurt, whey, sour milk and milk. They need a high protein diet to produce eggs constantly, if you have chickens that aren't laying give them a boost with some day old bread soaked in milk or porridge made with milk. They love this and will see it as a treat. If you have grain like wheat or barley, sprouting it for the chickens gives them a good nutritional boost. Simply soak the grains for a couple of hours in a large flat container, or upturned bin lid, pour off the excess water and keep the container in the shade, covered with a cloth. Wet and rinse the grains every day and drain off the excess water. When the grains sprout, feed them to the chooks. This is good natural supplement to help keep the hens' calcium level up. Either buy shell grit (at your local feed store where you buy chook food) or keep the shells of your own eggs and wash them out so they don't smell. When you have quite a few, put them in the oven, on a medium setting, for 10 minutes to dry out. When they're cool, put them in a blender and blitz them, or crush them inside a tea towel with your rolling pin. Store in a jar. The crushed shell powder can be added to the chook food as a calcium supplement. 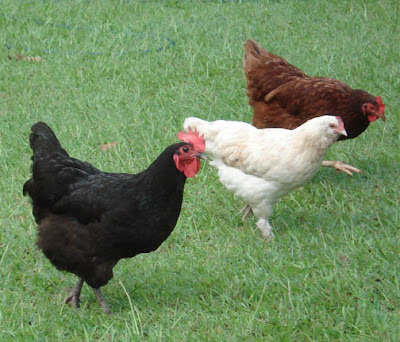 Your chickens will be healthier and will give you better eggs if you let them free range. When chooks eat grass, they will have Omega 3 oils in their eggs, this is a great bonus for you and anyone eating the eggs. Another little thing to keep your chooks healthy is to add some "real" raspberry cordial, with at least 25% real juice, or squashed frozen raspberries or jam to their water every so often. Read about it here. This is also a good treatment for diarrhoea (in chooks and kids). Bring to the boil and simmer for five minutes. Cool, then decant to clean bottles. Store in the fridge for up to two months or freeze. To a bucket of water, add about two tablespoons. You will know your ladies are maturing by their comb and wattles - the red bits on their faces. The comb and wattles will get larger and redder as they get close to laying. Depending on the weather, each hen will lay about five eggs a week, in the first year. It will decrease every year after that. They will stop laying when it is very hot or very cold and when they're moulting (replacing their feathers). When your girls first start laying, they might lay an egg with no shell or an egg with two yolks. The eggs usually start off small and get bigger as the hen matures. When the hen's hormones have settled down, you will get one ordinary egg with shell in tact. Collect the eggs once a day. Your girls will usually lay in the morning. Don't wash the eggs, as that will remove a protective layer on the shell. If the egg is dirty, rub it with a cloth and remove as much dirt as you can. If you still need to wash it do so, but use that egg next. Don't let it sit in the fridge. Eggs should be stored in the fridge, in an egg holder, so they don't roll around. There will be regulations on selling eggs in most places. We sell our eggs to friends and neighbours for less than they would pay in the shop. We put that money into the feed we buy. If you have a dedicated hen house, it will need to be cleaned out at least every week, depending on the number of chickens you have. Laying straw on the floor will help with the smell in wet weather, this straw can be placed on the compost heap after a couple of weeks. Don't expect your coop to be sparkling clean every day, it is outside and in a natural setting where wind will blow dust in and spiders will spin webs. It does need to be fairly clean and not smelly but it's not your kitchen. Hanno has attached our roosts to the roof so when he cleans the coop, he simply attaches the roosts to the roof with a clip and can easily clean the floor. If your chickens have lice - and it will happen from time to time - get some food quality diamateous earth and this will get rid of them. You can also rub it on the chooks, make sure you rub under their wings and around their comb and wattles. Read about chicken anatomy here. Pure breed chooks will go broody. They want to hatch eggs and become mothers, but unless you have a rooster that will not happen. Hens don't need a rooster to lay eggs but they need a rooster to fertilise them. When our chickens go broody, we let them, unless they sit there for too long - over a month - and start losing weight. Generally they'll sit for a couple of weeks, hoping you don't see them, and they'll be in the darkest nest. Just put your hand in and collect the eggs every day as you normally would. If you don't want the chook to sit on the nest, you'll have to lock her our of the nesting area, but even then, she might find another dark place in long grass or in the hay bales and keep sitting. They do no harm sitting, we feel it's best to just let them sit. This is Heather, our little French hen. She's a Faverolles - salmon coloured. She is broody almost all the time. You will notice that I've not written about cold weather chickens, I have never kept chickens in a cold climate so I hope that our friends and neighbours in colder areas will write about that on their own blogs and give me their link so we can visit to read what has been written. Please also write a post on your own blog is you want to add anything or if you do things differently - that's okay. This is just my version of keeping chooks. Again, post the link here so we can all read what you have to say. I'm sure I've forgotten a few things. If you want to add anything, either comment, or write a post and let me know your link. I'll add all the links to my main post. As readers come through, they can tour around, reading our posts and adding comments as they go. Please use the biggest kitchen table banner if you want to, just click on it and "save as". Adding it to your own post will be a visual sign that you are part of the kitchen table discussion. If you want to be a part of this, but don't have chickens or know how to keep them, please add your favourite egg recipe and send me your link. I'll include that in with the general mix of this. Readers, as you read, please add your comments to give feedback and to let the writer know you've visited. Comments encourage posters to write more. 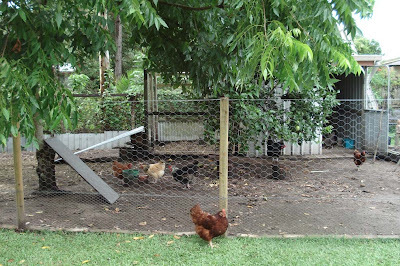 Darren at Green Change writes about his plans for a chicken ark and where to buy chicken tractors (in NSW). Thanks Darren, you have a great site. Linda at Remote Treechanger hasa photo of her empty chook house and written her Sausage and Egg Pie recipe here. Chookie from Chookie's Backyard has written a backyard chook primer here. Donetta shows us her chickens, chook tractor and some recipes at A Life Uncommon. Yategirl @ Kitchen Garden in the Suburbs joins the table with her photos of her chook house and chooks. 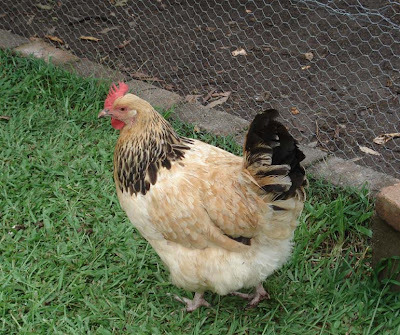 She also writes about chook noise, which is an important piece of info for new chook owners. 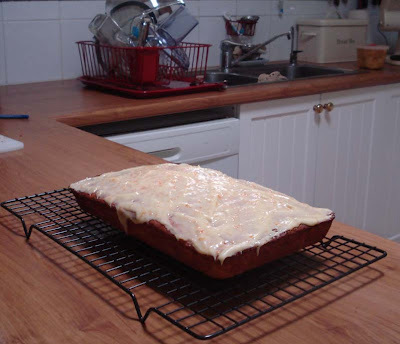 Hana has shared a cake recipe on her blog Marmota B. Thanks for joining in, Hana. You can see 25 lovely bugg Orpingtons over at Andi's To Be Quiet blog. Amanda shows us how chickens and small children mix together quite nicely. Amanda's blog is You Reap What You Sow. How true! Cyn shares her experiences with her flock at Yes Lord. Thanks for joining Cyn. Leanne from At the Good Life shared her story of chooks and her rooster, Rory. It highlights the benefits of keeping a good rooster. Linda has some fabulous photos of her Plymouth Rocks on her blog, Locust Trail Homestead, including a very handsome rooster. Welcome to the table, Linda! 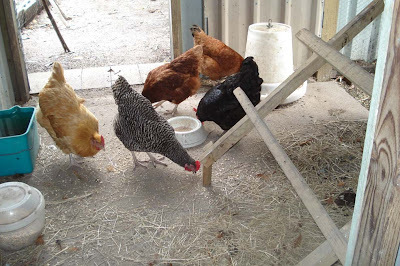 Tricia at Little Eco Footprints has posted about her mixed flock of very pretty chooks. She shows how well a small number of chooks fit well into a small backyard. 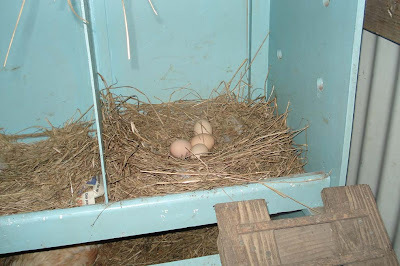 If you want to read about breeding chickens and hatching eggs, go to A Joyful Keeper to read Joy's very interesting post. Thanks for joining us, Joy! Cryptstitch has written about her very unusual white crested black Polish chooks here. Seeing the different varieties of chickens always amazes me. Shelle from Brand New Ending promised to write about her little flock of bantam Rhode Island Reds, and she's done just that right here. It's well worth a visit. Rose has joined us to tell us about her rescue chooks, and later, her tiny chicks. Wander over to Coastal Rose and read about her experiences. Thanks for joining the table, Rose. Marita at Moderately Me shows us a photo of the most Australian of scenes - a chook house next to a fruit tree. Ours is near lemon, Marita's might be a lemon or an orange. Thanks for taking part, Marita! Nell, I apologise. I did read your comment but forgot to answer it. We don't test our eggs, I don't think there is a regulation to do so here. We've kept chooks for 25 years and have never been sick after eating their eggs. Lucie from Touchatou has written a wonderul post, in English and French, about her chooks and the wonderful winter house her husband built. Thanks for pulling up a chair at the table, Lucie. There is a long and interesting post from Morgan at Growing in the Fens about their progression from a few chooks to 43. She's had chooks for eggs and the pot and there's a lot of information there. Thanks for joining in Morgan. 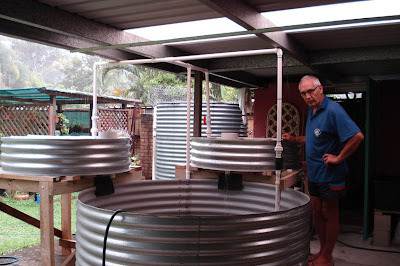 Alecat at Serenades and Solace has written about going from a chook dome to a rectangle chook run. 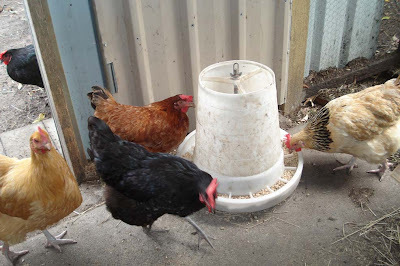 There are photos of chooks there as wll as one of a great chook feeder. Thanks for the post, Alecat. Linda has a delicious and simple egg recipe at her blog, Rebel Pigs. Thanks for joining the kitchen table. Linda. 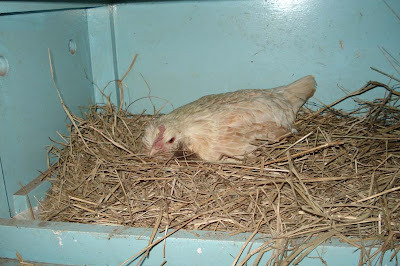 Leanne At the Good Life, has written about what she is doing to stop a chook from eating the eggs in the nest. Very interesting. I hope it works, Leanne. Thanks for joining in. 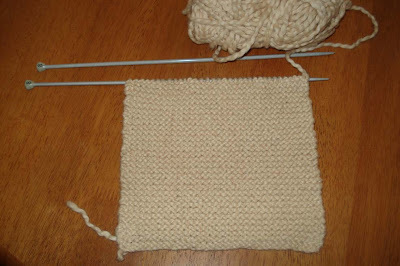 The last post is a wonderful one from Michelle at You Just Gotta Keep Knittin'. Michelle writes about the "joys and realities" of keeping chooks. She has some wonderful photos and a great chook house. Thanks for joining the table, Michelle. And one I missed, sorry Toria. 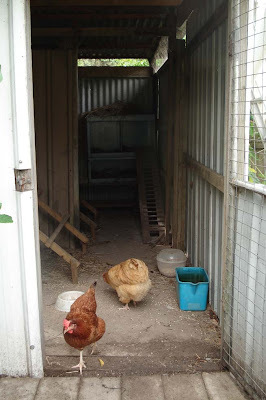 At Unfinished Business, Toria has written a post about her chooks and ducks. 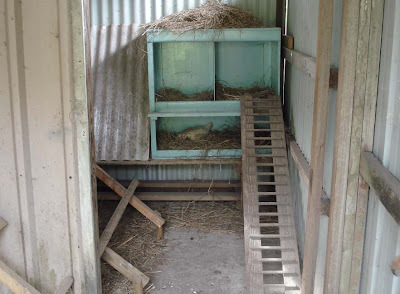 There is information about building chook houses, with links, a book recommendation, photos and a recipe. A very interesting post. Thanks Toria. Check out Rina's very interesting post at Into Still Waters about modifying rooster behaviour . It's well worth a visit. The Thinker @ Thinkers Rock has written about how she keeps chooks using the knowledge her grandma gave her. Can anyone help Melanie find pure heritage chickens in eastern Canada? A View from the Green Barn is not officially part of the kitchen table but if you have a wander over there you'll find a lot of info about chooks, and they have just bought a new fangled automatic egg turner. Crikey! Totally off subject but, here is some good info about dairy produce. Can you help with the swaps?